This book is a reprint of the same book from 2005. 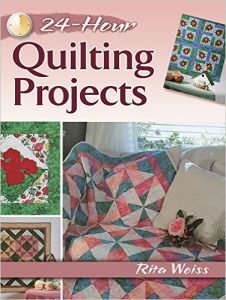 Because of this, it will be highly improbably for you to find the same exact fabrics as shown in the book. 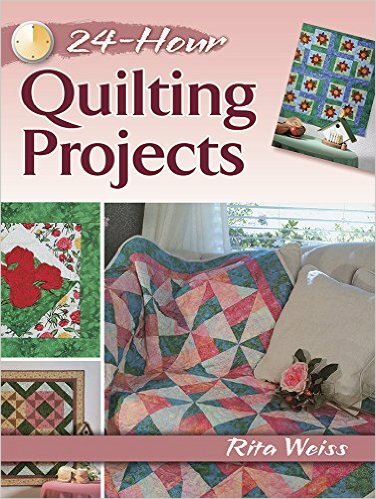 I’ve found that quilt fabrics go out of production fairly rapidly, so I am always happy to just use the fabric in photographs as a general guide rather than a specific one. 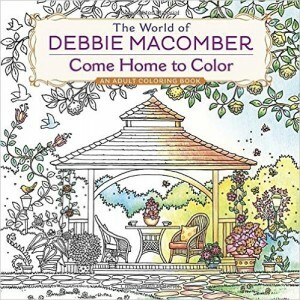 I am a real fan of Debbie Macomber and have enjoyed her books, movies, and television series over the years. Purchasing this book was a must for me – even without any idea of what the designs would include. 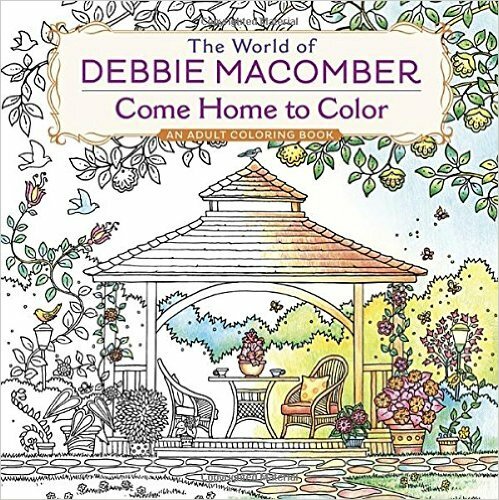 This coloring book depicts a number of scenes from various books, including: “Starting Now”, “The Inn at Rose Harbor”, “Love Letters”, “The World of Debbie Macomber”, Blossom Street Brides”, “Silver Linings”, and “Rose Harbor in Bloom”. While I might have preferred a different mix of designs, the ones includes are good and I will enjoy coloring them and sending them to just the right family and friends. The designs are sized down and include many small details. I find that a mix of ultra-fine markers, small nib gel pens and sharp pointed pencils work best for my coloring. Alcohol-based markers do not bleed through this card. I tried several applications of each type and could not get a drop through. Water-based markers, India ink and gel pens do not bleed through the page. Gel pens take a much longer time to dry but have beautifully intense color. Coloring pencils are mixed. The colors go on dark and solid but blending is not good for any soft lead that I have though the wax pencils work the best. Layering is good. Hard lead pencils make good clear marks and don’t dent the back of the page. I really enjoy coloring horse designs, especially those with extra doodles included for coloring fun. The Wonderful World of Horses is one of the best of this style horse coloring books I have. There are thumbnails of 30 of the designs at the front of the book. According to the product description, there are supposed to be 30 designs in the book but I count 31, so that adds a bonus page over what I expected in this book. The 31 designs are originals drawings by artist Simone Phillips. Her designs have a flowing look to them even though the horse(s) may be at a standstill. A few of the designs also feature a young woman along with her horse. The designs are detailed with some small areas but not to the point of tiny spaces to color. I enjoyed coloring both of my first two projects and did both of them with a variety of alcohol-based markers. In one, I decided to utilize the white space to be the color of the horse to make the floral designs in its coat stand out. In the other, I colored the horse with brown but had a lot of fun giving it a mane full of color. Coloring pencils work well with this paper. I can put color down with a light touch for a softer, grainy look or by pressing harder or applying several coats, I can get a good solid pigment look. Soft lead pencils blend and layer well. Hard lead pencils leave dents on the back of the page. I recommend using a blotter of card stock or heavyweight paper beneath your working page to keep the rest of the book in good condition. You can also cut pages out without any loss of design. This is a coloring book aimed at children. It includes some silly poems which should strike the funny bone of a child just right. The poems are original as is the artwork. I found that some of the words and concepts were definitely more geared towards the British rather than the US but was able to explain a bit to the child I read them to. Once he understood what was going on, he thought it was hugely funny. I usually test coloring books with my coloring medium but this time I also added in some of the types my grandson uses (namely crayons and crayon brand washable markers.) Those worked as expected with the crayons giving a decent coverage and the markers bleeding through. Gel pens and India ink pens leave shadows of color on the back of the page. Coloring pencils work well with this paper. Soft lead goes on well though I find that to get heavier pigment, I have to layer color on in thin coats. Hard lead pencils dent the back of the page. Crayons covered as expected (kind of grainy) but definitely acceptable for a child’s coloring project. I recommend a blotter page of card stock or heavy weight paper be used beneath your working page to keep ink and dents from marring the pages below. There are 16 hand-drawn designs in this coloring book. The product description mentions 19 but I count 16 so perhaps there has been a revision to the book. The designs are eclectic and imaginative. They range the gamut from hot air balloons to owls. There is a nice level of detail but the elements are not too small and don’t require special ultra fine nibs in order to color. I chose a dragon for my first project. I colored it in a variety of alcohol-based markers. I find that alcohol-based work better for me with this paper and designs, so that is how I will probably continue with the book. A few of my favorite designs from both books are included; however, I feel that they included a few too many “wallpaper” repeating designs rather than putting in some of the more iconic scenes that were spread across two pages in the original books. There are so many designs I would have preferred but that is only my taste in the artwork. While I was a little disappointed, I won’t detract a star in my rating as the artwork that was included was done extremely well. 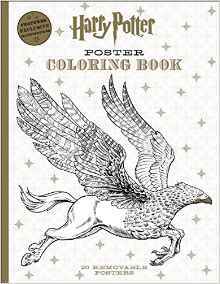 This is a really beautiful grayscale coloring book. It features the artwork of Alena Lazareva and is the first book I have by this artist. I do have another quality book by the same design group, Wingfeather Books and have really enjoyed that one as well (Spirit Animals) which was the second grayscale book I had purchased. I’m very impressed by the beautiful of the artwork. Within minutes of receiving my copy, I ordered additional ones for some family members who want to try grayscale coloring. There are 38 designs in this book plus four preview pages from Mermaids, Fairies & Fantasy giving you a total of 42 pages to color. I think that is a huge bargain considering both the price and the quality of the artwork. I generally use just coloring pencils on my grayscale (and I am fairly inexperienced at it in general) and recently have done some in just alcohol-based markers. For my first project in this book, I wanted to use both. I used the markers as a basecoat and then went over the entire design with pencils. What was fun about doing it that way was that I could get the coverage I wanted with the markers and then still make pencil stroke marks in the hair like I do with regularly coloring. It was fun and maybe not as successful as it good be but I will keep trying until I learn the technique properly! Paper is typical CreateSpace which is thin, white, slightly rough and non-perforated. Gel pens and India ink pens leave colorful shadows on the back of the page. Coloring pencils work well with the paper. Soft lead can be put on thin or heavy, they blend and layer well. Hard lead dents the back of the page. I recommend a blotter page under your working page to keep ink and dents from messing up the pages below. I own a number of line art coloring books by Molly Harrison. I have enjoyed them tremendously for the beautiful artwork and design. I have recently begun working in grayscale and, while I am not very experienced with the process, I enjoy working with the actual grayscale of the artist’s actual artwork. It is a very different process from coloring and I am still exploring all the ways to accomplish it. With this book and Ms. Harrison’s other new grayscale book (Bohemian Fantasy), I was inspired to work in alcohol-based markers rather than with pencils as I have been doing. It provides a really different look as markers give a translucent feel versus the opaque look I get when working with coloring pencils. 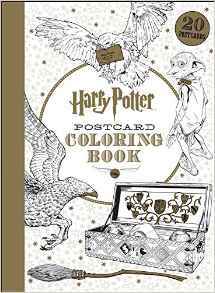 There are 25 pieces of art to color in this book. If you haven’t tried grayscale before, I found working in this book to be both easy and fun. That was why I was comfortable with trying new methods. There is a lot of shading present and the tone of the grayscale printing is medium which allows me to either add blending or not depending on my mood. In my first project, I did a lot of blending in the night sky but less in the other elements. Designs stop before the binding and have a framing line around the outside of the artwork to provide a stopping point and a more elegant look. Gel pens and India ink pens leave color shadows on the back of the page. Coloring pencils work well with this paper. You can put down light to heavy color, it blends and layers well. Hard lead pencils leave dents on the back of the page. You can cut pages out of this book without losing any portion of the design. I found that I could easily get the book to lay flat for coloring. I also decided to keep my pages in the book for right now and used a blotter page to keep ink and dents from marring the pages below. This is my second grayscale coloring book by Molly Harrison. While I usually use coloring pencils, I used alcohol-based markers with my first project in this book and I enjoyed it so much, I will continue with it. The designs are grayscale versions of Ms. Harrison’s actual artwork. The designs are of young women’s faces with beautiful elements, such as the night sky or flowers twisted throughout their hair. My first project was almost an abstract of a young woman though her face is shown realistically. I was able to use a wide choice of grays and purples for the sky and and for parts of her face. It was beautiful in a very understated way. The designs themselves are printed in a medium grayscale which allows for blending with pencils (which I used for her eye) as well as the translucent look of markers. Designs do not merge into the binding area. There is a framing line around the outside of each design so you can cut the page out without any design loss. Coloring pencils work well with this paper. You can put down light to heavy color, it blends and layers well. Hard lead pencils leave dents on the back of the page. I also suggest a blotter page when working with hard lead pencils as they can dent the next page as well.